Although the knife Alex Man uses to shave his head has not been sharpen, he still has the audience sweating bullets for him. Best Actor Alex Man Chi Leung and Best Actress Carrie Ng Ka Lai worked together again on the film ZOMBIOLOGY: ENJOY YOURSELF TONIGHT. Sister Ka Lai said that she has loved zombie movies since she was little, in addition because Man Ji agreed to perform she took the role. Sister Ka Lai said that although the film was about zombies, it actually wanted to bring out the message -- everyone should cherish those around them because you never know what to expect. Working with Man Ji again, Sister Ka Lai said that she knew he rarely made Hong Kong films. Not only viewers, even she wanted to watch his performance on the big screen. "Man Ji often played heroes on television and in movies. Actually he is even more detailed with his regular people characters." As for her performance, it was different from her past lady of the night and big woman characters. "I played a Cantonese Opera troupe boss lady. Because the loss of both legs I was unable to become a diva, so I trapped myself in the troupe." Sister Ka Lai said that she has loved to watch foreign zombie films since she was little. At night she would dream about being in zombie chases. Now she had the chance to participate in a Hong Kong zombie film, it was a lot of fun. She even wanted to play a zombie. However Man Ji did not have fun at all. Zombies not only chased him at the market, he also had to block gun shots. At age 60 and with diabetes he even had to put on special effect make up in the scorching July summer for the shoot. Man Ji said, "My special effect make up took half a hour, July was very hot and hard to take. I kept sweating, but the assistant used a blow dryer to dry the sweat and make the make up glue dry faster." 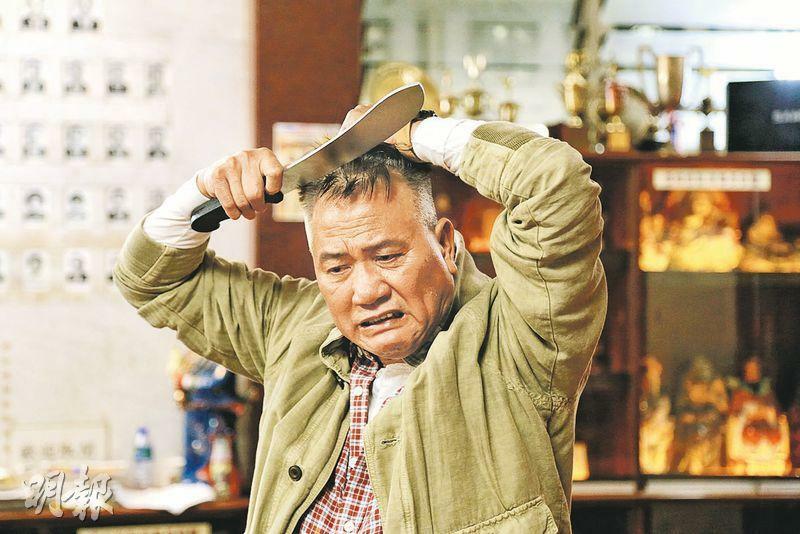 Man Ji has not made a Hong Kong film for years, why motivated him to take the role this time? "I only took it according to my health condition. I have diabetes. Two years ago I spent nine months to brew my own Chinese herbal medicine and the condition has already improved. In recent years I have been living in the Mainland. Last year a film boss through a mutual friend contacted me. I was very happy that my health was able to handle it, otherwise it would have been very tough and unpleasant because I wouldn't have the energy. Yet I really liked this job, having a healthy body to complete the job that I like -- that is the great happiness." working in Hong Kong again, he realized that many at work were new faces. Finally he ran into a gaffer he has worked with before, now he was already a mentor. Man Ji lamented how fast time passed by. It was also the first time he promoted a film nonstop. In the film Sister Ka Lai and Man Ji worked with Michael Ning (Bak Ji) and Louis Cheung Kai Chung. Sister Ka Lai said, "They have a lot of experience and can be said as outstanding actors of this era. I have noticed their work so I was cautious around them. I didn't want them to overshadow me. In addition Man Ji was an acting spirit, how could I lose?" Privately they were very harmonious. The process was very pleasant. Speaking of Bak Ji calling Brother Man Ji the leader on the set, Sister Ka Lai said, "Nothing gets by Brother Man Ji!" Man Ji revealed that Sister Ka Lai was so convincing in her performance that he worried. "In one scene Ka Lai could not stop sobbing, she almost completely collapsed. The entire set was suddenly silent." She explained that after the director yelled cut, she could not stop her emotions so she continued the performance. After that she felt great, but Man Ji was concerned about her.